This entry was posted in Posts, Site Update and tagged Certification, Dayworks, FIDIC Red Book, FIDIC Red Book 4th Edition, FLOWCHART, Malaysia, Valyation, Varaition Order. Bookmark the permalink. MCCL, I found that while trying to print out the flowchart with the laser printer, the graphic does not come out very clear and the reading from the link will require enlargement in order it can be read clearly. From the reading, I found one area that is of interest from the flowchart relating to clause 52.3 on the Engineer to consult the employer and the contractor and to re sum as adjustment to contract price. Your flowchart indicates that if agreement is not reached, the flowchart goes directly to dispute to be resolved. To my knowledge, in this section, there are two parts of agreement – a) the entitlement, b) the quantum. 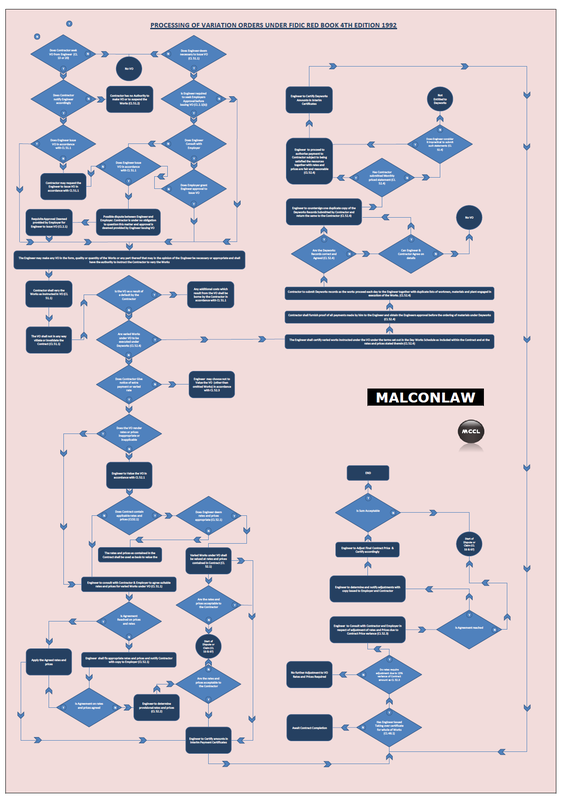 If the entitlement agreement is not reached, then the flowchart will directly goes to dispute to be resolved. However, if the entitlement is reached and the dispute area is in the quantum, in my knowledge, the engineer is still obligated to determine the sum payable to the contractor (this way the contractor will still be paid; not necessarily the amount he claimed) then only the balance on the disputed sum goes for dispute to be resolved. Please enlighten me on this issue. FIDIC has revised his red book with a new version of 1999. Would be very interesting to have if the latest can be referred to. TQ.